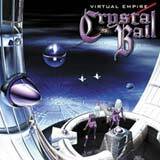 Crystal Ball has returned with their third album, Virtual Empire. With this album, Crystal Ball deliver a good lesson in what well done melodic hard rock / metal should sound like. Chalked full of addictive melodies and wonderful chrous lines, Virtual Empire is an album sure to win significant time in your CD player. Aside from a brief intro, Virtual Empire contains twelve fantastic songs that range from the touching ballad (Look In My Eyes) to almost power metal like tunes (Hands of God, Blind Side). Each song is highly melodic and there are no fillers or weak songs on the disc. After only a couple of listens, you can look at the track list for this album and remember the melody for each of the songs. Particularly strong are the thick backing vocals and guitar solos that almost "sing" with emotion. The lead vocalist is perfect for this type of music as his voice is very melodic and he can hit the high notes with ease. Check out Am I Free for a stunning example of how well he can handle the higher octaves. He reminds me a lot of Andi Deris with a higher range. The keyboard textures are used in such a way to give the music an uplifting atmosphere. As a result, this is the type of album that would be a good cure for a down day or a good one to throw in the mix when you're in a Harem Scarem, Axxis, or PC69 type of mood. The musicianship is top notch and the production is also top notch as the vocals and each of the instruments are turned to just the right level to make this album extremely easy to listen to and very memorable. Simply put, fans of melodic hard rock/metal will find a lot to appreciate with this album. With Virtual Empire, Crystal Ball will hopefully receive some well deserved attention in the melodic metal / hard rock scene. Without a doubt, I certainly appreciate their music as much as the "big boys" of this genre such as Humanimal, PC69, Jaded Heart, and others. Great work guys!